Pope Francis has overhauled the Vatican institute most closely associated with the conservative sexual morals promoted by St. John Paul II, saying it was necessary to adapt and expand its mission to address the reality of today’s Catholics. Officials said the revamped John Paul II Theological Institute for the Marriage and Family Sciences will offer degrees in the social sciences — such as sociology, anthropology, psychology — as well as biology and other sciences, reflecting a vision of the family that goes well beyond strict Catholic theology. The inclusion of biological sciences in the curriculum, and a mission statement that cites a focus on human “regeneration” and care for the planet, suggests that the revamped institute will address human sexuality, the environment and the church’s position on artificial contraception. With a motu proprio issued on September 19, 2017, Pope Francis closed the Vatican institute set up by St. Pope John Paul II to study marriage and family life, replacing it with a new institute with a different name and different focus. The papal document, Summa Familiae Cura, formally ends the work that started in 1981 as the Pontifical John Paul II Institute for Studies on Marriage and the Family. In its place the motu proprio establishes the Pontifical John Paul II Theological Institute for Marriage and Family Sciences. The new institute is intended to take a different approach to the study of family life. It will reflect the work of the two recent Synod meetings and the Pope’s own apostolic exhoration, Amoris Laetitia. In Summa Familiae Cura the Pope emphasized the Church must respond to the needs of troubled families, and couples struggling with the marriages, in a society that no longer supports the traditional Christian understanding of marriage. 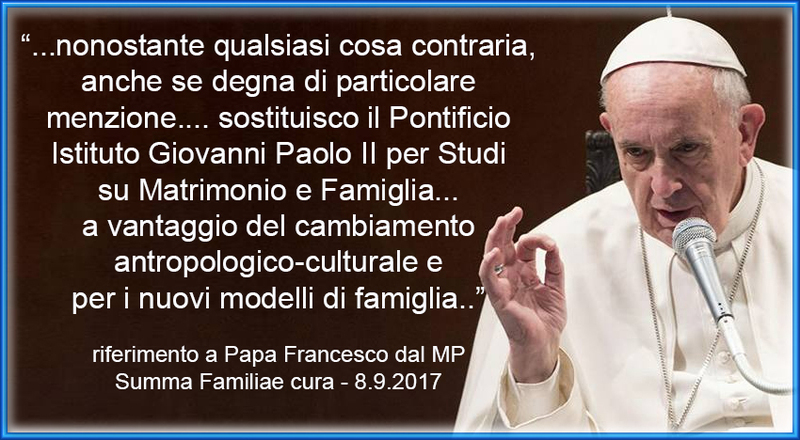 Pope Francis also stressed the need for the Church to incorporate the perspectives of contemporary science in analyzing family life. My take: Pope Francis continues remaking the Church from a museum into a garden. Nice to see a post and one with something positive to say. Is Francis in time and has he enough time? When will he start to underpin his new pastoral approach with doctrinal change? Why is he not restoring those priests silenced by the Ratzinger/Müller to full ministry? Hi Polo, I’m finally retired, so now I have time to write. Thank you for your comments. I always like hearing from you. I think Pope Francis came in the nick of time. Like the first Francis, his mission was to rebuild a ruined church. I think the liberal and moderate faithful would have hung in there, but it’s nice to have spring after 40+ years of winter.. I think he will manage backlash by continuing on with his agenda, and not stopping to get defensive or engage with critics who are not interested in any renewal or change. That strategy by conservatives is designed to chew up time and energy–two things in finite supply. He needs to implement enough change by the time he dies to throw the conservative train off the track. Which he has accomplished! The rest is up to the whole church. In re: to the silenced priests and theologians–I hope so, but Pope Francis, with so much trouble and garbage to deal with has had to prioritize. The doctrinal change is going to come from the personnel changes in the Vatican departments and the new bishops he has appointed. Hi Karen. Great to hear from you in the comments section as well as the odd (now to be more frequent?) post. There is no shortage of things going on to make good subject matter.